King's Arms Pub and Restaurant01535 645197work Public HouseThe history of the King's Arms goes back to the 17th century. In 1841 Enoch Thomas, a friend of Branwell Bronte, was the Innkeeper. The current private rooms upstairs were home to the Manorial Courts, whilst the local undertaker used the cellar as a mortuary! With its gruesome past, it is probably not surprising that the locals claim that the King's Arms may be haunted. Meals served all day, either in the bar or the more luxurious surroundings of Duke's Bistro. Licensed. Vegetarian options. Children welcome. Credit cards accepted. Groups accepted. 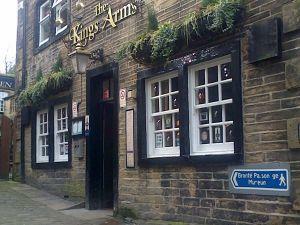 The history of the King's Arms goes back to the 17th century. In 1841 Enoch Thomas, a friend of Branwell Bronte, was the Innkeeper. The current private rooms upstairs were home to the Manorial Courts, whilst the local undertaker used the cellar as a mortuary! With its gruesome past, it is probably not surprising that the locals claim that the King's Arms may be haunted.